Who Wah. Wah Who. - Schaefer Advertising Co.
Two years ago we reintroduced a 100-year-old cheer back into popularity among the TCU faithful and the Fort Worth community alike. This cheer has soaked into the collective TCU community and is now a highlight of the TCU fan experience. It’s a part of student orientation, a staple across social media and tailgate talk, and has spread wildly thoughout merchandise. With this strong endorsement building year after year, it is humbling to see the “fire” we started in partnership with TCU Athletics in 2014. When TCU looked to us to bring a 3rd rendition of the in-game video to life, we looked no further than the fans themselves. 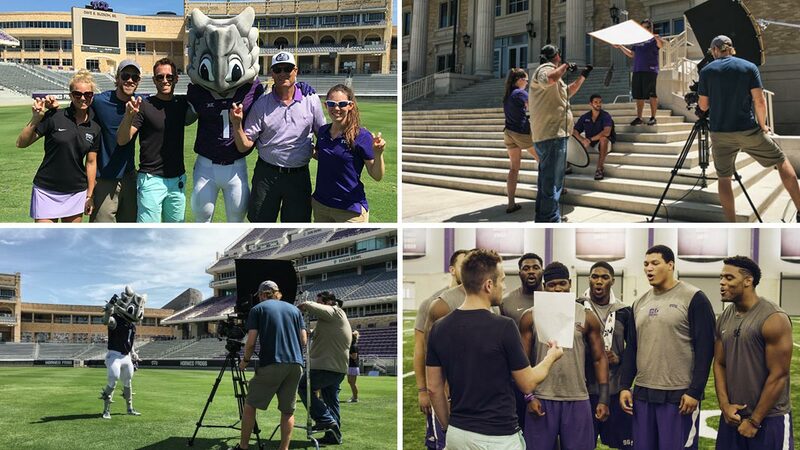 This year we filmed the very fabric of this spirited, TCU fan base. 120 people to be exact. We weaved together 3 unique edits of the cheer and told a collective story for each and every home TCU football game. We brought in TCU and Fort Worth heroes and kept the anticipation of the surprise ending in each game. With a few games left in this season, we know there is a whole lot of fight left in the Frogs. And after you watch this video, you’ll see the fans aren’t done yet either!